Germs can spread through a home so fast it makes your head spin. A child comes home from school with glassy eyes and suddenly everyone in the family is down for the count. It may seem like a losing battle, but there are plenty of ways minimize this. Caring for a sick child isn�t exactly a party, but it�s much worse when you�re sick, too. It adds up to missed school days and having to call out from work. Stop things from getting worse with a few basic steps. To keep germs from spreading in your home you must be vigilant, particularly during the dreaded flu season. Since packing the whole family in a bubble isn�t possible, the next best thing is to put up a fight � contain the virus and take measures to minimize germs in the future. The following tips are only useful when applied routinely by every member of the household! This may seem obvious, but it cannot go without stating that washing your hands is among the most effective ways to stop germs in their tracks. It�s estimated that around 80% of infectious diseases spread either by direct touch or when you touch something that has germs. It�s impossible to eliminate contact with bacteria all together, but washing your hands with soap and warm water will remove them before they can infect you. While on the subject, remind children not to bring their hands to their face. This directly delivers germs from the fingers to the mouth, nose or eyes, where they can enter the body. It�s not enough to run hands under water. 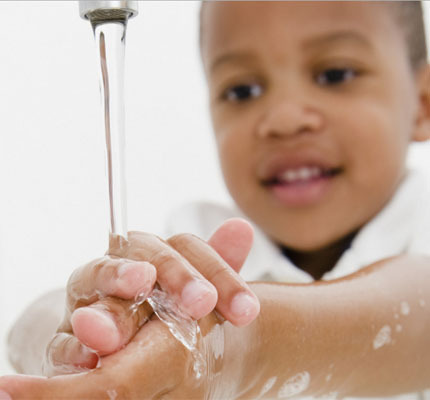 Teaching kids the right way to wash their hands is simple - they need to rub them with soap and warm water for at least 20 seconds. Make a game out of counting or tell them to sing �Happy Birthday� twice. To keep germs from spreading in your home, be sure to wash your own hands regularly and keep them away from your face. Sounds obvious, but it�s painfully easy to forget when you�re looking out for everyone else. They�re going to invade, but you can kill germs by regularly sanitizing areas known for collecting them. This includes moist areas like toilets, in and around sinks, and toothbrushes. Use disinfecting wipes or spray and wipe down all surfaces constantly, especially when people are ill. Some of the germiest surfaces include doorknobs, railings, light switches, books, electronics and toys. Wipe down what you can. Along with sheets, clothes and towels, many stuffed toys can go in the washer/dryer � put them in a tied pillowcase if you�re worried about damaging them. A number of plastic toys can go in the dishwasher. Replace old sponges and toothbrush heads at least every three months. In the mean time, sanitize them every week or so. Toothbrush sanitizers will help you maintain good oral health. Soak sponges overnight in a cup of hot water with half a cup of vinegar and a few teaspoons of salt. You can also microwave wet sponges for two minutes, but they absolutely must be wet. Throw away used tissues, and empty trash cans often. Be vigilant regarding these prime areas where germs pile up. According to the Center for Disease Control, the best way to keep germs from spreading in your home is to get vaccinated. Explaining to kids how vaccines work often makes them seem less scary. If you hate needles, opt for the mist instead of a flu shot! Sharing isn�t always caring. If colds tend to bounce around from one family member to the next, have everyone change their sharing ways. No more eating off of each other�s plates and try color coding cups so they can�t get confused for someone else�s. Killing and preventing the spread of household germs is a team effort. Enlist your family to do their part and everyone will be much healthier.